The last few towels flew off the loom, and I pretty much flew by the seat of my pants in deciding what colour combinations to use. For the fifth towel, I went with one in kelly green and magenta, which is definitely one of my favourites of the whole bunch. It's really bright and I like how the colours work together. With the sixth towel, I realized that I was running out of towels to weave, and I wanted to get back to orange, since I had really liked the previous orange one a lot. Since I had done it with magenta already (and didn't want to do anything too tonally similar like the dark red) I matched it up with the dark purple. I like this one a lot too. The other light colour I'd only used once was yellow, and while I toyed with using it against the kelly green or against the orange, I was afraid that they just wouldn't have enough contrast to be visually interesting. I went with magenta instead, since both of my previous magenta towels turned out so pretty. In the end, I think it's a bit too similar to the yellow/red combo (until you see them next to each other they look pretty close) but je ne regrette rien. 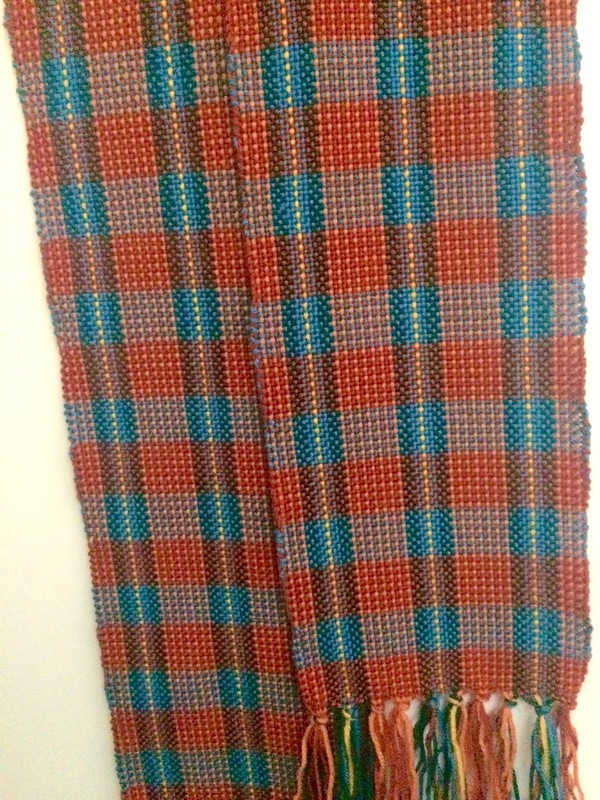 I had to get them off the loom quickly because I have a time-sensitive project to weave - Handwoven magazine is taking submissions for designs for a new e-book and I wanted to weave up a sample to submit it - but once that is all done, I will hem and wash and iron these towels and show them off as a set. After doing the last colourful set of towels, I really wanted to do another set in some different colours, and keep playing with the concept. 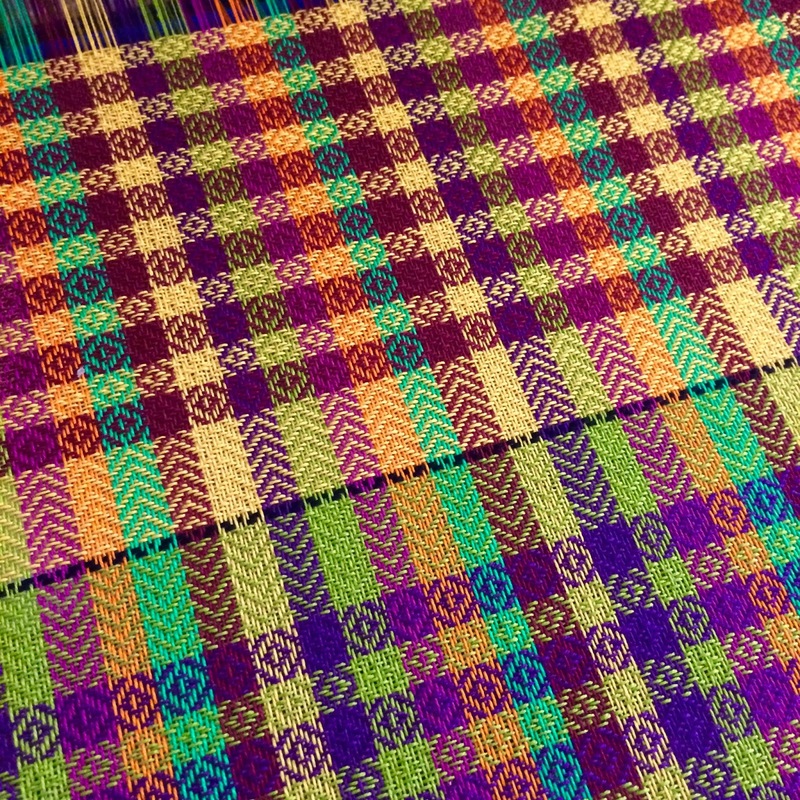 I thought it would be fun to do a set in Mardi Gras colours (purple, green, and gold) so chose a couple of shades of each and used a weaving program on the computer to come up with a point twill stripe design that I liked. In the end, I also added a deep red to help balance out the darks and lights in the design. My initial plan was to do seven towels in total, with each of the first three towels in one of the three colour groups. I started with one in Kelly Green and Pistachio. You can see it at the bottom of the photo. The two colours are both relatively light, and there wasn't a lot of contrast between the stripes. 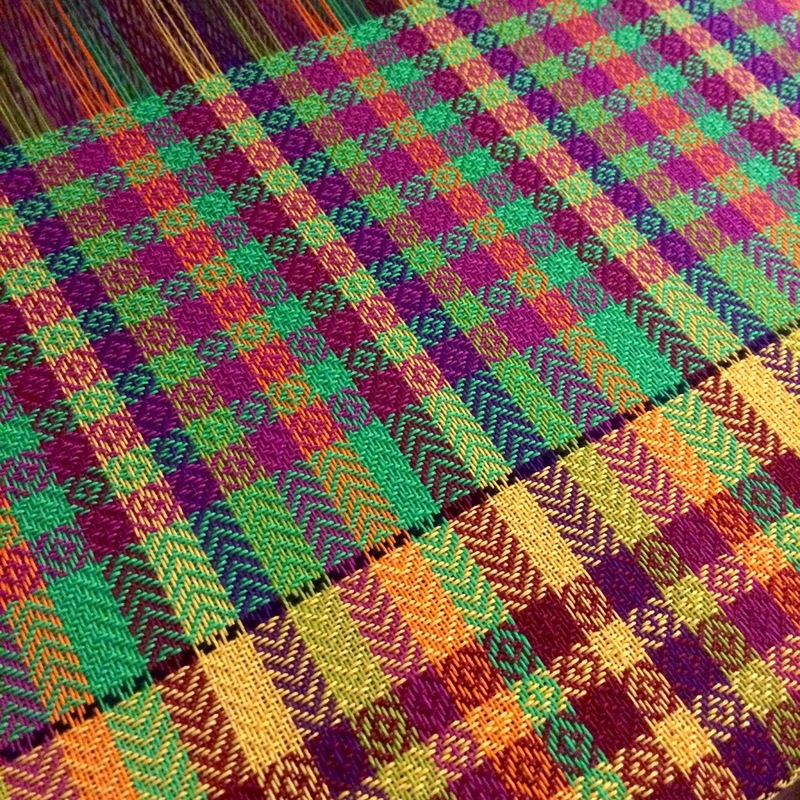 It made an overall wash of green over the colours of the whole warp, which I didn't hate, but it wasn't what I was imagining. I decided to nix my initial plan to follow up with a purple/magenta striped towel and an orange/yellow towel. I wanted more contrast between the stripes to make the towels more visually interesting. With that in mind, I did the second towel in orange and magenta stripes. This one had a lot of visual pop and I was really happy with how it turned out. 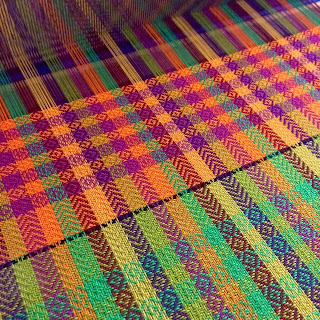 The colours have a good amount of contrast and they give the warp colours a lot of variation. 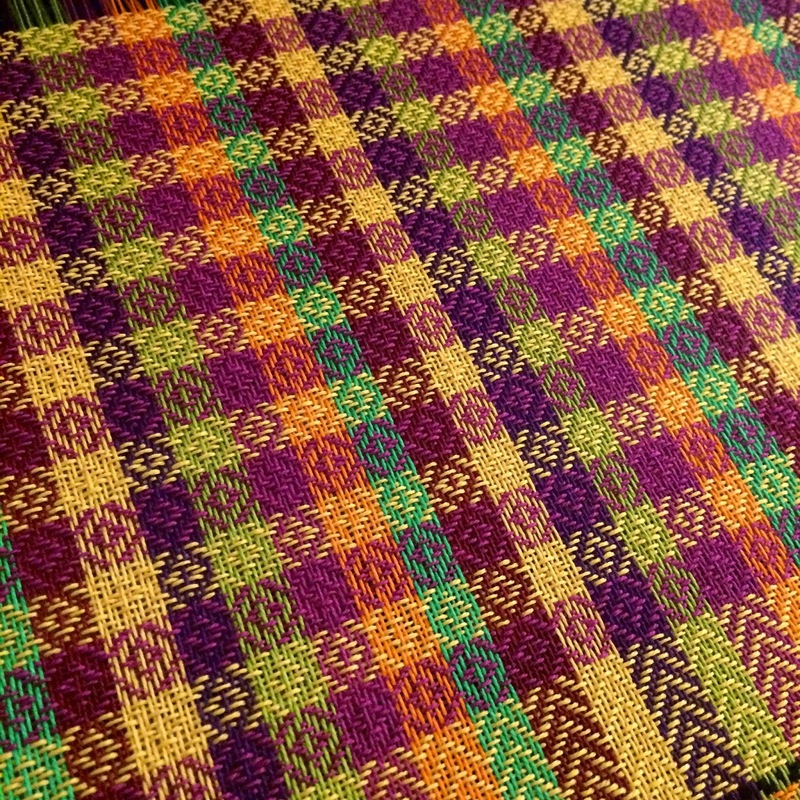 I like how the twill diamonds alternate between columns when the weft stripes alternate between dark/light. In the green towel, they only show up distinctly in the dark warp stripes, since the greens are both so light. For the third towel, I stayed with high contrast and did a towel with stripes in Pistachio green and a deep Purple. Again, I think the contrast makes it much better and I like the green better here. I went with yellow and deep red stripes for the fourth towel. It is only subtly different than the previous one, but definitely still pleasing to the eye. That passes the halfway point for the towels, since there should be a total of seven. I have a couple of colour combinations planned for the last ones, but to be honest, I'm actually reconsidering doing the yellow/orange combo... and even the purple/magenta... what do you think? I got some sock yarn with the Cookie A Sock Club a couple of years ago, and started to knit up a pair of socks with it, but it just didn't feel right to me. The yarn is a mix of wool and silk, and it didn't have a lot of stretch but it did have a lot of shine. It also was a bit thick for my sock preference, these days, and ultimately I frogged the sock and set the yarn on the shelf. I thought I might knit it up into a little one-skein shawl, but the yardage was a bit short for even doing that (and I hate running out of yarn before the end of a project) so it sat and sat, waiting for me to have an epiphany. So I spent a few days knitting up a cute little cowl and I've been wearing it off and on. The variegations in the yarn somehow ended up as stripes, but I'm ok with that. It's still silky and shiny and drapey and warm. I may have even converted myself to a cowl person. I finished weaving the green towels a while ago, and now they are all folded up, sitting and waiting for me to hem and wash them. 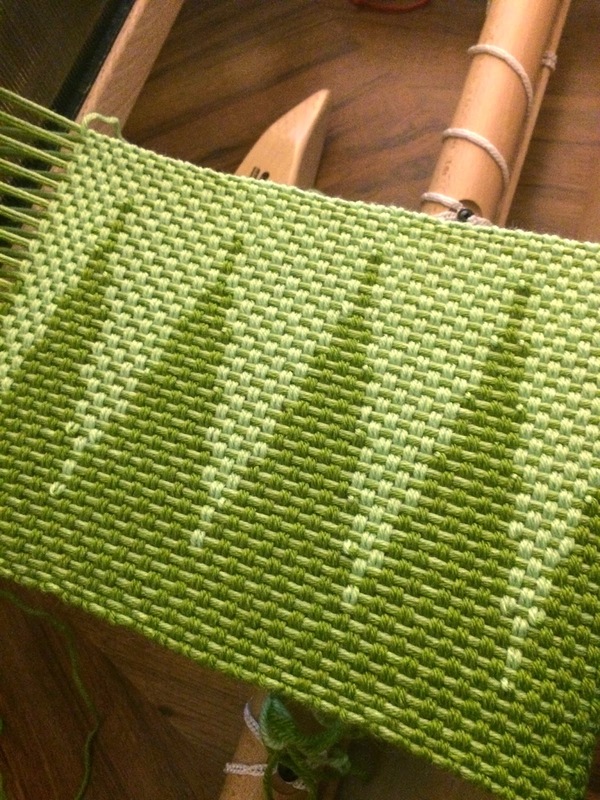 In the meantime, I thought I might as well share a few more photos that will show each of them in progress, on the loom. I wanted to change things up with the second towel, so I did this variation in an X patterning. I like the way the Xs make a lattice to connect the pattern into a more unified design than the little unconnected Os. If you refer back to my earlier post, you might be able to see the difference in the overall lattice. For the third towel, I went back to the Os (even without the lattice that connects the design I prefer their roundness to the thornier Xs) but with yet another variation on the design. This one made lots of little squares and some cool equal-armed crosses. 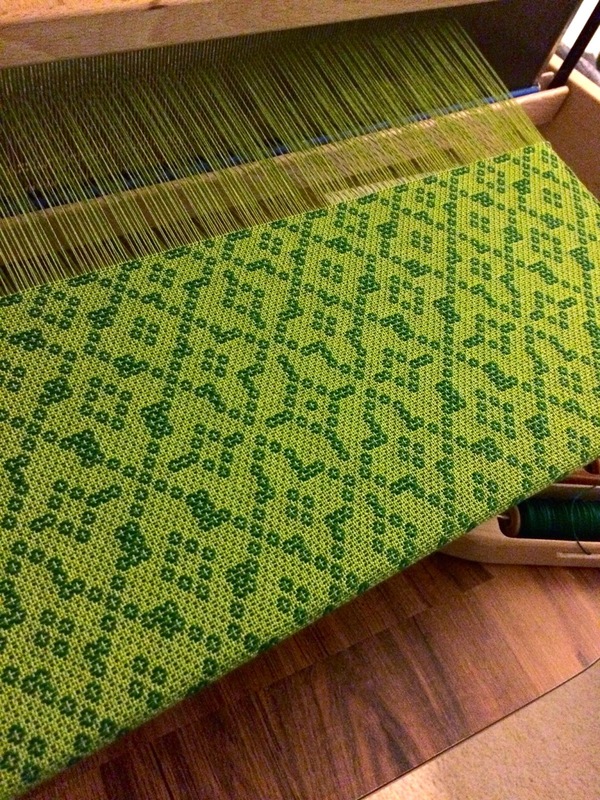 I really liked the way this one looked, as I was weaving it, and I was almost sorry to come to the end of it. I think the negative space is interesting, and I look forward to seeing the reverse side, too. With the fourth towel I finally did some dukagang. For some reason I always think I won't weave this structure for the sets I make (probably because it is so different from the others and I worry that it will stand out too much) but then I change my mind and do it. It always ends up my favourite, in the end. It has a very different look than the others, with a more vertical direction to the whole design, but I felt like it really worked with the sort of medallion shape that this tie-up variation has in it. 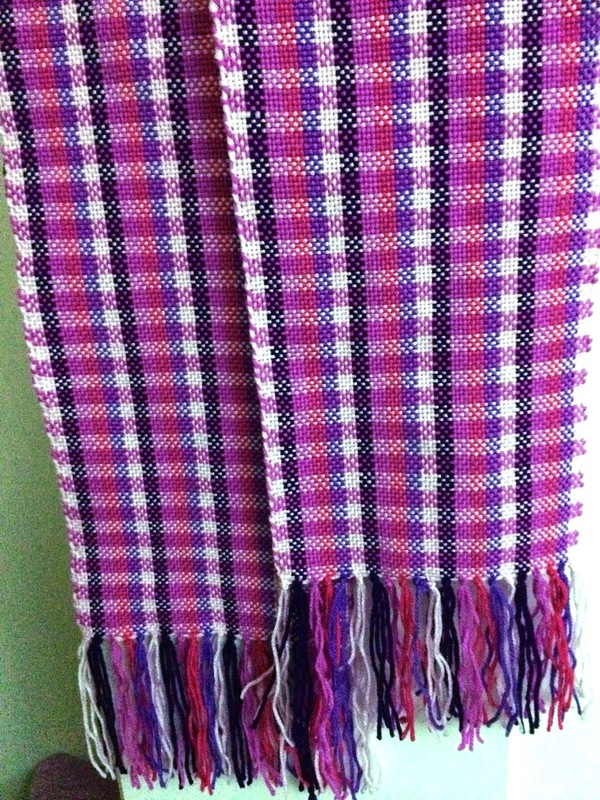 Having finished those four, I pulled out the purple pattern weft and started one for myself. I used the same tie-up variation that I used for the dukagang, but this time using the Os. 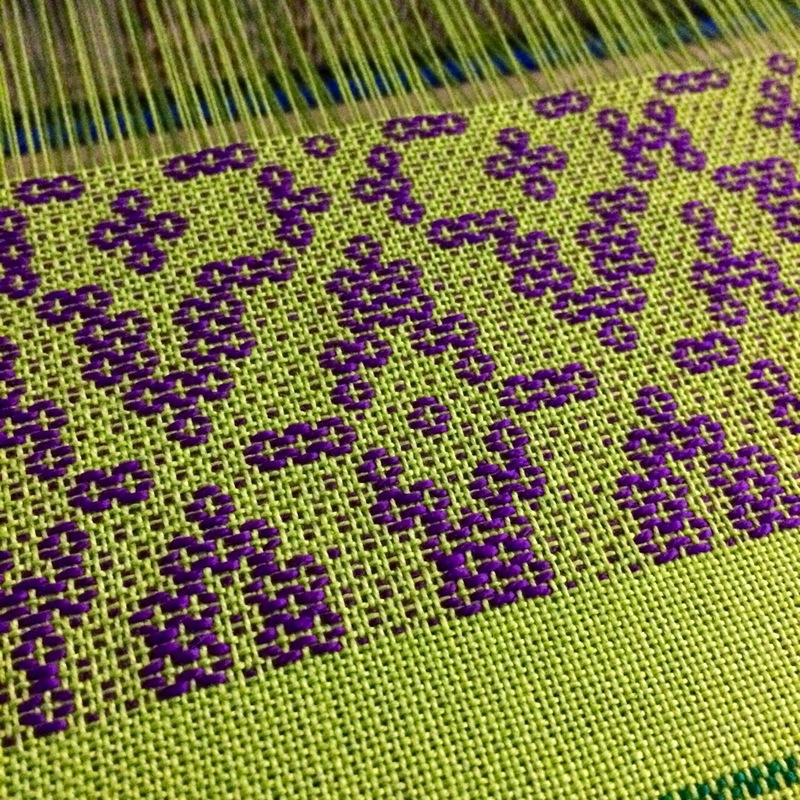 I'm not sure I love the purple as much as I thought I would - the green background gets a bit muddied by using this colour for a pattern weft. It might actually have been better in dukagang, as well, since the colours would be more isolated. Live and learn. One of these days I will get around to washing and ironing them and then you can see what a difference finishing makes! As time marches on, here at Chez Crafty, I am completing projects at a much faster pace than I have been blogging them. 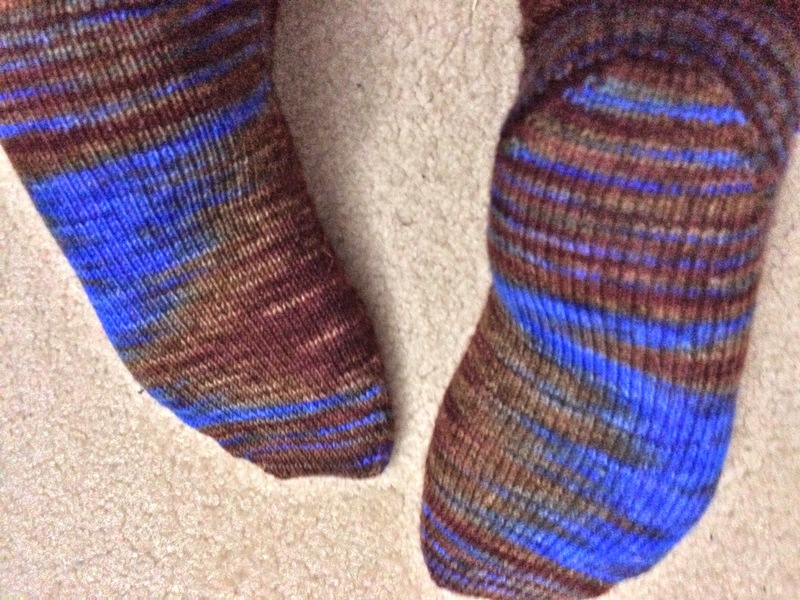 I have had it pointed out to me that I am being remiss in keeping everyone up to date with my goings on, so here is a finished-sock round-up for you, to get things started. First a simple two-colour striped sock, as is one of my favourites. I did the usual 3:1 ratio of rounds, this time as 6 rounds grey to 2 rounds pink. I love how these turned out - they are a really cozy colour combination and so comfy. The second pair is one that I took my time completing - one of my knitting groups had decided to do a stranded colour work knitalong, and I chose this design. I pretty much only worked on them when I was with the group, so they took a long time. The pattern is a super fun one, that you build as you go - components of the design are printed off onto paper and made into dice that you roll to decide what the overall sock will look like, 10 lines of knitting at a time. The randomness of it and the anticipation of what the next section would add to the design kept me going on this one. Of course, stranded knitting makes some thick warm socks, so I probably will wear these around home on chilly mornings, and not so much in shoes. When Knit Picks reintroduced some new colours of Felici self-striping yarn, I couldn't resist picking up at least one colourway - this one is called Rustic Cabin and I fell in love with it. Didn't take long to make a lovely pair of stockingette toe-up socks. I will have to keep my eyes peeled for more Felici in the future. There is nothing I enjoy more than peacefully knitting mindless stockingette and having it come out in pretty stripes without any effort on my part. 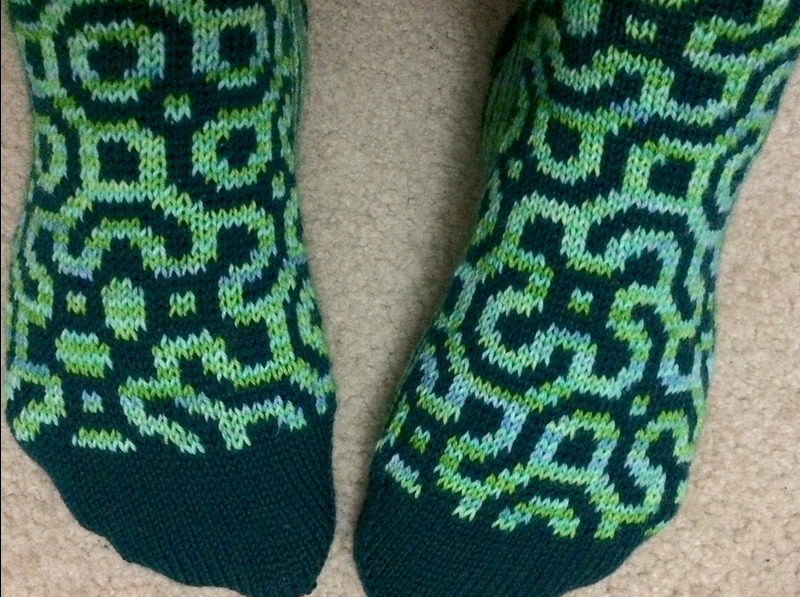 Finally, Hazel Knits did a knitalong for March/April - this cool pair of socks were the recommended design. I thought they were super pretty and just happened to have some beautiful silvery Hazel Knits yarn in my stash, so I knitted some up. The original pattern had beads, as well, but I left them out. I think they're still really beautiful! Of course I have two more pairs on the needles right now. I will never run out of socks! 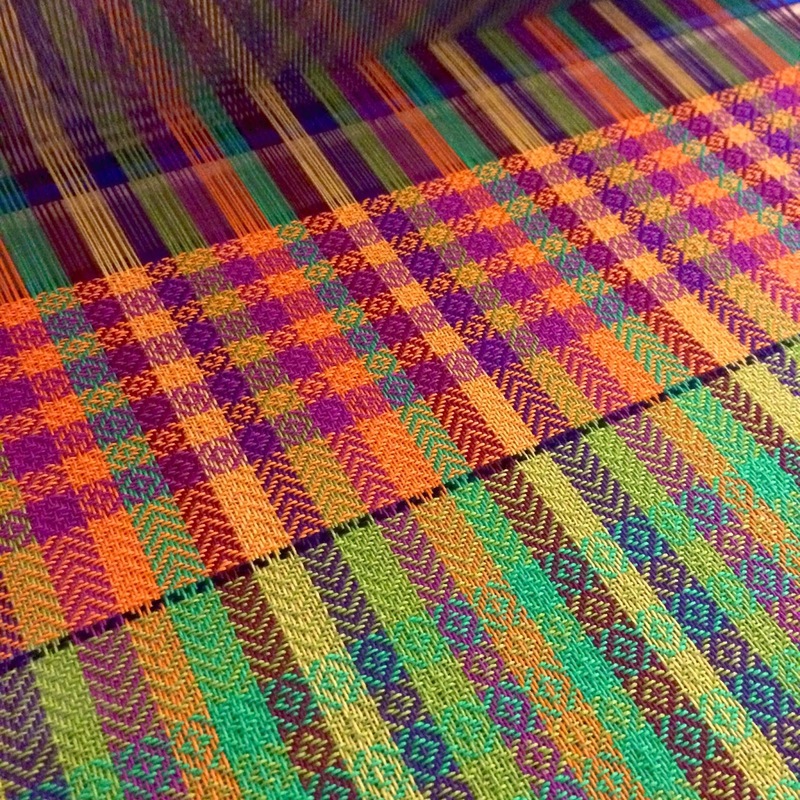 Many other things are going on, as well, including completed weaving projects and new weaving projects, so stay tuned. There are a lot of fun weaving structures in the world, but having tried Summer & Winter once, I have had a strong urge to keep playing with it. 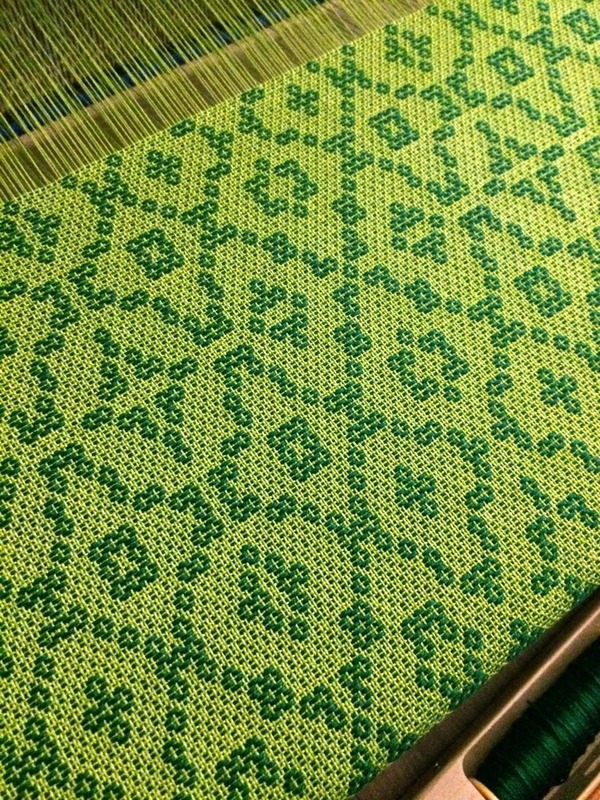 I used another name draft to come up with this pattern, but then one of my weaving reference books reminded me that I can use different tie-ups with the same threading to make lots of variations on the same design. 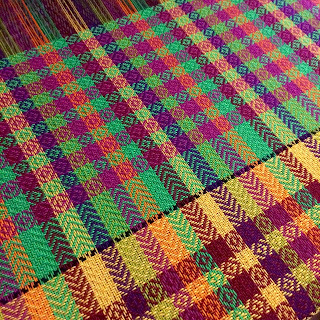 Since I am on a table loom, I don't actually use tie-ups at all, but rather make the variations line by line, as I am doing the actual weaving. This really opens up a myriad of possibilities for me, and as such, I decided to make a bit of a longer warp and do five different towels. I am about halfway through the first one, and really can't wait to see how the rest turn out! When someone has many passions, it is always fun to find little ways to overlap them. A while ago, I found a great little yarn dyer called Nerd Girl Yarns, who dyes skeins of yarn in lovely nerdy themes, like Firefly and Sherlock and one of my newfound passions, Doctor Who. Even the hard heart of a girl trying not to buy more variegated sock yarn has to be softened by such delightful fare. Doctor Donna has lovely portions of both a nice brown from Tenth's suit, as well as a beautiful deep Tardis blue and a deep auburn reminiscent of Donna's hair. I was hoping for the best as I began at the cuff, where the blue and brown seemed destined to make a nice path around and around the sock. By the time I was done the leg, I knew I was in trouble. The blue pooled at the back of the leg, and didn't make much of an appearance at the front. I shrugged it off because I knew things would change up at the heel flap and gusset. The blue appeared, making several stripey rounds of different sizes as the sock circumference changed. Then I got to the foot and realized that it was no good, the blue would somehow stay on the sole for the entire foot of the sock. As you can see in the photo (with a cat paw included not so much for a size comparison but because my cat is determined to become one of those viral internet cats) the blue only reappeared again at the toe. There is a second sock, though, I thought. Well, you can see what came of that. Somehow it turned out almost exactly the same. The Tardis: No, but I always took you where you needed to go. I guess the yarn took me where I needed to go. I started just playing around with different colour combinations, since I have a lot of colours to work with, this year, so I made a scarf with a combination of red/orange/yellow in the warp. 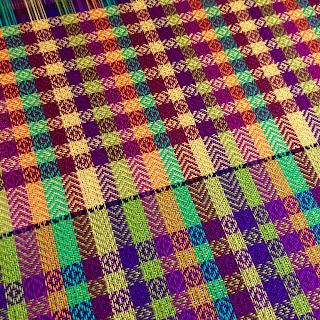 I was going to do the whole weft in a lighter yellow (as you see in the bottom right of the photo) but decided that the light colour was washing out all of the vibrancy of the warp. I plopped some orange stripes in there, and that helped, so then I switched to some darker paprika stripes and liked that too. For the darkest colour, I also shrunk the width of the stripe, just to keep things interesting. I think the way it changes looks pretty cool. 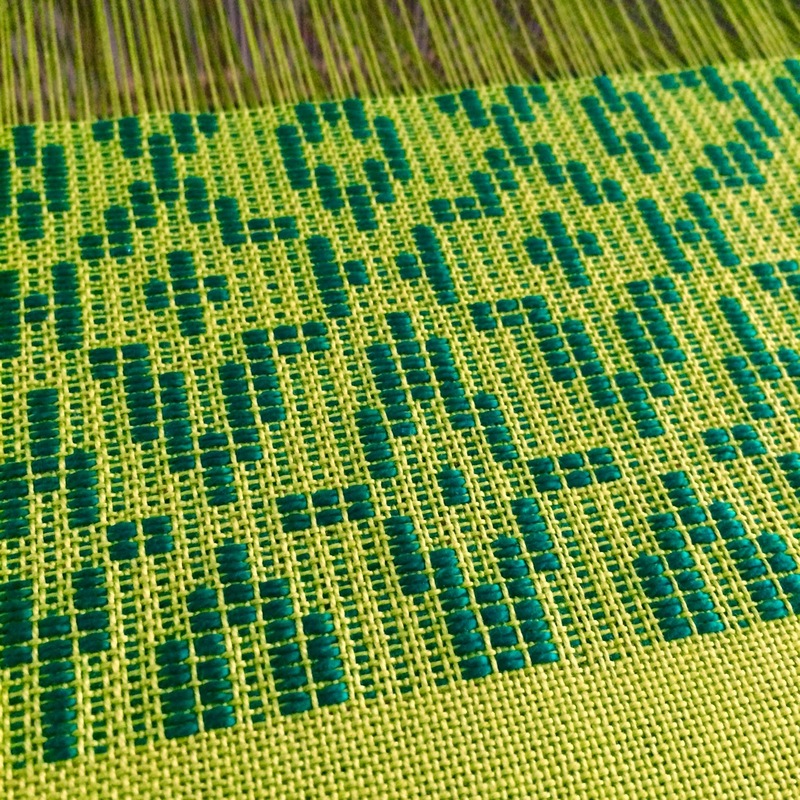 Then I decided to try something with a greenier tone, so I put a couple of pale greens and a yellow in the next warp and wove it with a light blue and a darker blue/green, in an unequal ratio. The combination of colours makes me think of Aquaman, though I'm sure no kids today would even know who that is. 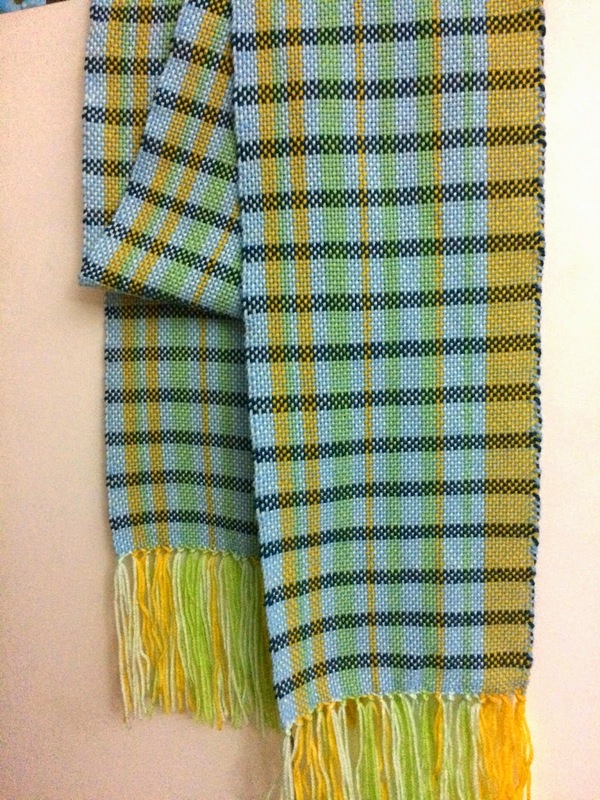 I was looking at an example of the clasped weft technique in one of my old weaving magazines, a while ago, and had an epiphany, that I could use it to make a cool zig-zag scarf. It didn't take long to get from there to the idea of a Kermit the Frog scarf, emulating the little green pointy collar he has around his neck. The technique worked perfectly and was so easy! Maybe I'll use it again sometime to do something more harlequin-y. Having done a Kermie scarf, I thought the pink and purple one I followed up with might suit Miss Piggy, since it made me think of her purple opera gloves. 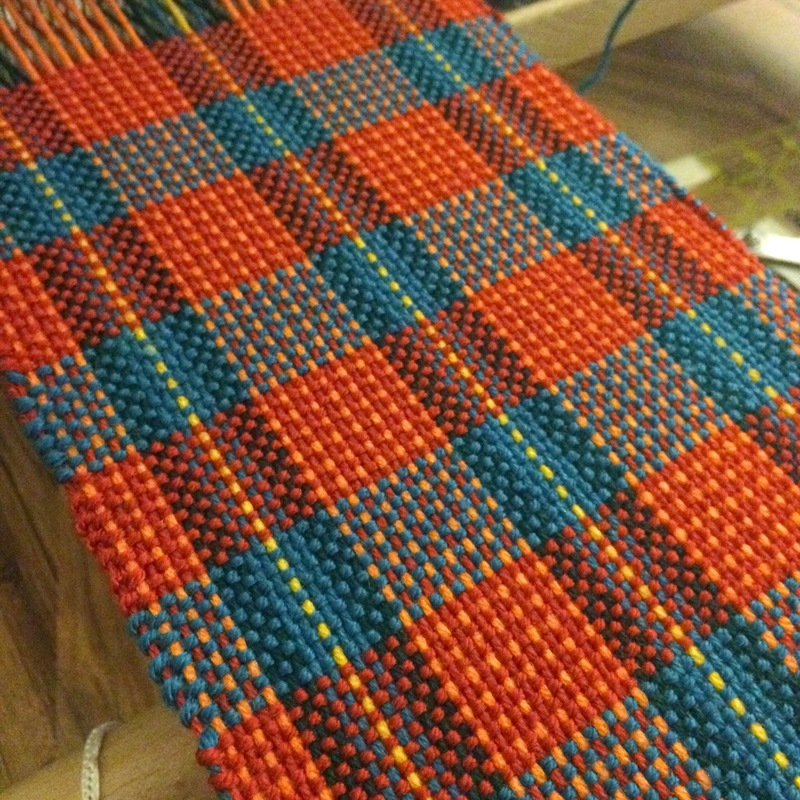 I chose a bunch of colours for evenly spaced stripes in the warp and then did a two-colour stripe for the weft. It's nicer than this, in person, I just couldn't get the colours right in the photo. So it's that time of year again, where I occupy my weaving loom (Miss Bennet) with a whole series of quick and fun and colourful scarves for donation. This year I inadvertently started out with a bit of a Disney theme, since my first inspiration was to weave a scarf for all the little girls who want to be Elsa, from Frozen. I just picked a handful of representative colours and did the warp randomly, and the weft in little stripes of two colours. Then my next thought was of a recent favourite Disney lady of mine, Merida, from Brave. I did a tartan-ish design (she's Scottish, so duh) and used the colours of her dress and hair to weave it. 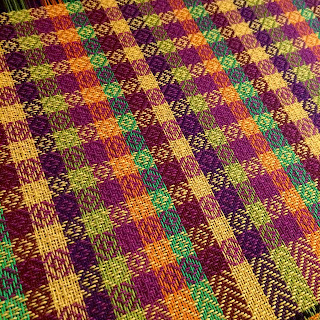 I really love how it turned out, particularly since I was lazy about it and just used two of the colours for weft, when there were so many more in the warp. My third inspiration was Maleficent, from the recent movie version with Angelina Jolie. 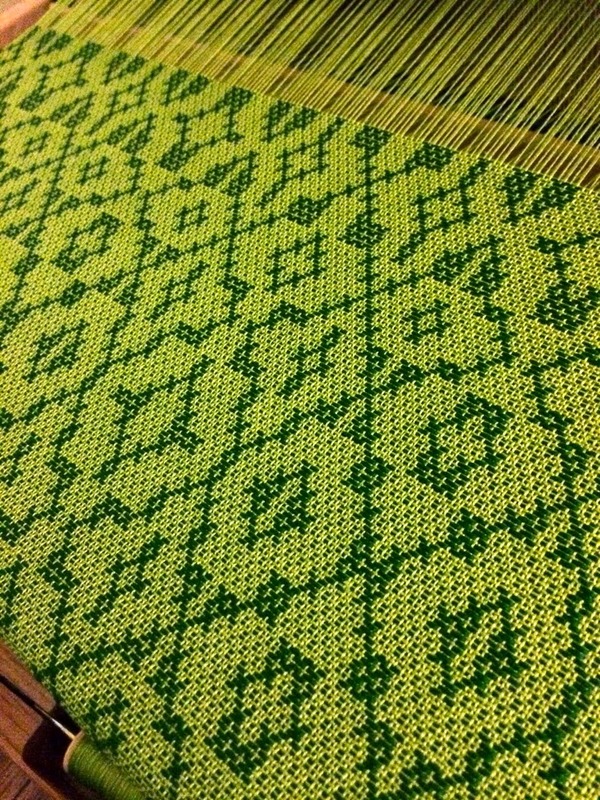 I used a bunch of darker colours in the warp (and again two in stripes in the weft) but this time did an inlay technique with a couple of shades of green (like green misty magic.) Well, the two shades of green turned out to be a bit too close, since they look pretty much like the same yarn, and the mist might look more like PacMan, but I still think it's really cool how it turned out.